You’re nicked, or you will be once we have a stretcher! 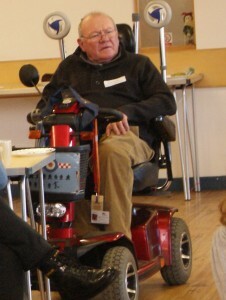 Alan Turner is not only Chair of Shrewsbury MS Society, he has, for the last four years, also been involved with something called the DIAG (Disabled Independent Advisory Groups) and entertained and informed us with information about what this involved in his blog in January. Here he shares a few more little gems that come out of his meetings …..
A couple of issues ago I put an article together describing the Disabled Independent Advisory Group (DIAG) which operates with West Mercia Constabulary, so I thought it might be useful to go into greater detail regarding some aspects of its work. If the force is planning a specific operation which might involve someone who is disabled then a member of the group having that particular disability would be invited to advise during the planning phase. Equally we are often asked to look at police stations to determine the adequacy of access for the physically disabled as well as lighting configurations for the partially sighted and so on. A couple of years ago I and two other colleagues were asked to review the custody procedures. After a couple of days pouring over them, all appeared to be OK except for one glaring fault. We had a meeting with some senior brass at which points were raised and discussed so, when it was my turn, I asked if police officers were trained, therefore qualified, to carry someone in my condition should I need to be arrested and handcuffed. One of the bobby’s said “No sweat mate – we’ve got appropriate vehicles to get your mobility scooter to the nick”. Since this wasn’t what I meant, I went into more detail. “As you can see I rely on my walking frame to get around. How do you expect me to cope if handcuffing is essential?”. That threw them completely so I demonstrated by walking (?) around the table; on a good day I can cover 35m in about twenty minutes so I’m not exactly going to leg it am I ?! After a bit of soul searching “the boys” went away having agreed to have another look. The result? In future if someone such as me needs to be cuffed it was agreed that the paramedics would be called out so that I could be put on a stretcher and carted off to the cells. As there are varying degrees of physical disability the police also agreed to make a point in the procedures exhorting the arresting officer to take that into account. I have no idea what the procedures look like today so, unless I misbehave, I may never know….. If this article interested you, or you have a point of view or want to ask a question, please use the comment box at the base of the page. SDN actively encourages comments and contributions. D’you know what an IAG is ? No? I thought not. Neither did I until four years ago when I saw a letter in the Shrewsbury Chronicle from Kate Arnett when she wrote to invite people to volunteer to help West Mercia Constabulary. Being a supporter of what the police try to do for us all, I sipped a couple of pints of public spirit and applied. So, what is an IAG? Some eight years ago “they” decided that it would be a good idea if the police constabularies, throughout the UK, were given the opportunity to learn from members of the public who had specific problems in a personal or social sense. As there are groups of people who have such difficulties, it was decided to form three types of Independent Advisory Groups – there you are, that’s an IAG, we’re nearly there. One group would embrace Black Ethnic Minorities, a second the Lesbian/Gay/Transexual community whilst the third covered Disability in all its forms. The overall aim of each IAG is to be a ‘critical friend’, together with the provision of first-hand experience or advice. Equally important is the fact that such advice might be sought where a specific police operation was being planned. Each IAG meets four times a year and then there are two other occasions when all three IAGs meet together. I went to my first Disability IAG in 2006 and thought it would be a good idea to share my thoughts with you. OK there was, as I suspected, a certain amount of political correctness but beneath it all there was an undoubted desire on the part of the police in West Mercia to pick our collective brains as it were. IAGs consist of up to twelve individuals, from all walks of life. In our case there are people who have particular disabilities. Like Dennis, a retired JP, who has not been able to walk normally since birth. There is Peter who has learning difficulties, but he gave a short presentation on a subject which is of concern to Mencap and did it extremely well indeed. Clearly there is brain behind the outward evidence of Peter’s disability. Then there is Pragma a lovely lady who has suffered from grave self-doubt and depression over the years, but such is her determination to overcome her problems she has found enormous strength of character to produce a most positive outlook on life; she told me how much she now enjoys it. We also have two ladies one of whom has been blind since birth and the other who lost her sight in her teens. Me ? I have MS and my legs don’t function – small beer compared with my colleagues. I think it important to pass on a couple of things about which most people are unaware. Did you know, for example, that West Mercia Constabulary are extremely keen to employ full-time staff who are disabled (yes, you heard right), but for some reason they aren’t attracting applicants. The point was made that as long as the individual had the right background/qualifications/experience they would be considered for employment no matter their particular disability. So, if you are looking for a job with the police you won’t be expected to do an assault course in the selection process. Go on. Gofrit! Did you know also that individual IAG members are co-opted onto such things as the Estates Committee where they help the police to improve accessibility to, for example, Police Stations, and I have attended several such meetings. I have also attended, along with representatives of the other two IAGs, three meetings to help with the production of a Counter Terrorism policy document. In my experience the police have always asked sensible questions to which they have reacted in a most positive way. West Mercia is always on the lookout for more volunteers for the IAGs. As far as the Disability IAG is concerned, we are hoping to recruit additional members especially where there is any form of sensory impairment. If you know of someone who might be suitable please put them in contact with Ann Shaw who is the full time Diversity Advisor for West Mercia Police; she can be contacted on 01952 214 637 at Malinsgate Police Station in Telford. I’ve only been at it for a short time, but the omens are good. If this article interested you, or you have a point of view or want to ask a question, please use the comment box, below. SDN actively encourages comments and contributions. This entry was posted in Blog on December 12, 2010 by Clear. A very interesting and informative article Alan, if only I had more time! Like everything in life, so it seems, all these groups, laudable as their activities may be, are formed and say they act on behalf of minority gorups or disabled groups, yet are little known by the people most concerned about. There must surely be a mechanism, say, via the socials services, who can contact their ‘categorised’ clientele and inform individuals of what’s available out there in the wider world of their four walls. At least they would know what support systems are out there. This matter is of course beyond the emit of this blog; so perhaps readers with some clout can take this further. Else, from experience and observation I note that the same people attend all these advisory/support/friendly assocaitions/societies/groups/networks etc.. and the agenda is dictated from above. Some of what Sid says is true, however, the IAGs have only been in existence for about five or six years and it does take time to get things established; we only meet four times a year. I can confirm that within the West Mercia Constabulary area a document defining IAGs, their activities (including the definition of hate crime), is to be published in the next couple of months. It is called “True Vision” and will be available at all police stations at no cost. The document also tells the public how to report a hate crime. “True Vision” is a product of both the IAGs and the police who assisted with definitions and reporting procedures to be used. As its name implies all will become clear on publication. Thank you Alan for this very informative article and to all who have left comments. I knew nothing about this until I logged on this morning and decided to have a read. It is great that we have this wonderful website and can share information with other people. A comment was made to me yesterday by a fellow member-She said “Wow since you told me about SDN website I have learnt so much things, found answers to things that I have never solved before-its just great” I look forward to others leaving comments and learning more. So Thank you.